This is an unofficial Norfolk Southern Railway railfan page, not affiliated with the Norfolk Southern Railway. 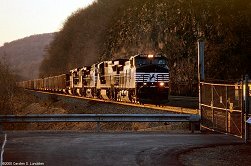 The official Norfolk Southern website is here. For years I've wanted to expand my Western Pennsylvania Railfan's page with the two major railroads, the Norfokk Southern (NS) and the CSX. Rescanning and organizing the photos, while also shooting newer material, has turned out to be a long proces. 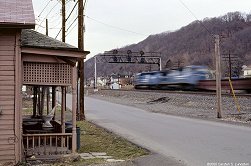 So for now this page will simply feature my better NS photos (and late Conrail photos) from around Western Pennsylvania, without any particular order of location and/or time. Most photos are from the greater Pittsburgh area. Below is a map of the NS in Greater Pittsburgh. The map dates back to 2001, and while the NS has seen very little changes in infrastructure, the other Pittsburgh Railroads have seen changes that are not yet reflected on this map. For a current overview of all Pittsburgh's railroads please see this map instead. 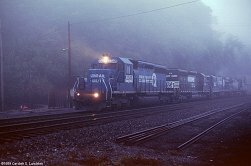 This was just around the time of the NS takeover of Conrail - June 1st 1999. 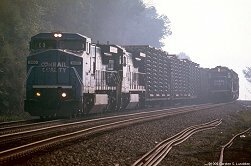 This loaded coal train is rolling east on the Conemaugh Line, near Apollo. 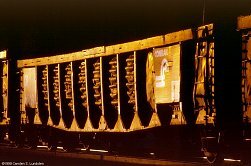 Coal loads about to roll under the 31st St. Bridge, approaching Etna Yard. The signals in the background are CP Herr. This was one of those hazy days with almost contrastless sunshine. June 1999. Eastbound RoadRailer crosses the Allegheny River on the Ft. Wayne Bridge. The view was from my apartment in the Pennsylvanian, the former Pennsylvania Railroad station. 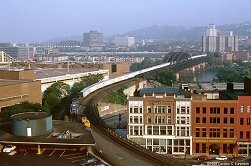 During my stay in Pittsburgh from May 1999 to June 2000 I stayed in various corporate apartments. Most of them in an apartment complex on the North Side, seen along the river under the tail of the train. None with a view as good as this, but almost all of the time with at least some view of the Pittsburgh Line. Many evenings I went to Emsworth after work. There used to be a group of people gathering there in the evening to watch trains or boats going through the locks. 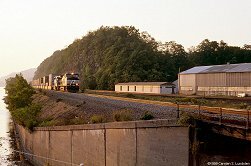 Here an eastbound stacker approaches the locks in the late afternoon light in September 1999. Photography is no longer allowed by the locks. Emsworth again, a foggy October morning in 1999. A westbound stacker rumbles by. A little later that same October morning, same spot. The train to the right was tied down, waiting to yard in Conway Yard. I believe this was while the NS was backed up all over Pittsburgh, this train being the 6th or 7th in a line stretching all the way down from Conway. Behing this train another 3 trains sat side by side east of CP Bell, and yet more on the Mon Line. 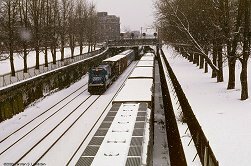 Jumping ahead to early February 2000, a snowy day made a neat scene here in West Park on the North Side. The train to the left is the local to Etna, powered by an old 4-axle GE in each end to ease switching along the way. The signals are CP Penn, where the Pittsburgh Line (the outermost tracks) merge with the Conemaugh Line. 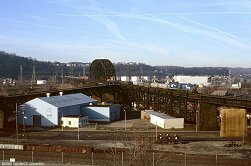 The Ohio Connecting Bridge is an impressive structure, which includes a junction (CP Isle) on the north end. This northbound mixed freight is approaching CP Bell, where it will become westbound on the Ft. Wayne Line towards Conway Yard. The track branching off to the left connects with CP Penn and primarily takes loaded coal trains to go east on the Conemaugh Line. Back at Emsworth in March 2000. 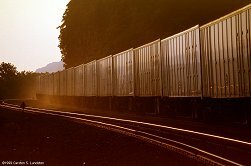 Coal empties roll towards the coal fields in the last light of the day. Again at Emsworth, westbound RoadRailers in the light of the late afternoon. Same location, same light, but this time one of the gazillion worn and beaten gondolas that are all over Pittsburgh.